The Bureau of Meteorology’s MetEye is an interactive forecasting tool that allows Australians to view detailed seven-day weather forecasts anywhere and at any time. MetEye is a graphical forecasting tool that brings together seven-day forecasts, satellite and radar imagery and near real time information on temperature, rainfall, cloud cover, humidity and wind speed. 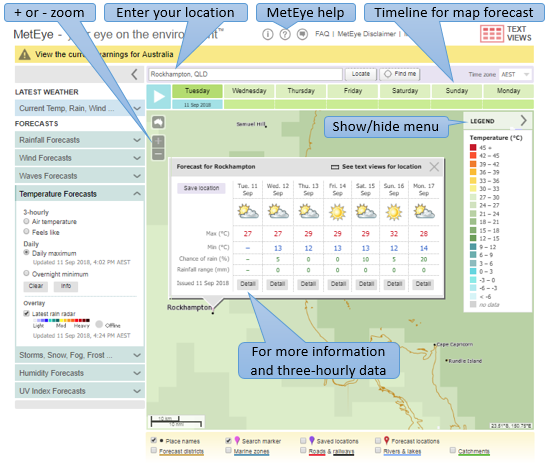 MetEye allows people to view the data behind the general weather forecasts in greater detail. The forecast maps are created by the Bureau’s meteorologists who use sophisticated tools and techniques to refine forecasts for local conditions. Below these options is the Overlay section where you can also turn on or off information layers such as the latest rain radar, tropical cyclone tracks (when a cyclone is active), river conditions and current cloud cover. The map overlay and legend will automatically adjust to display the options you have selected. When you select one of the forecast options, a timeline will appear above the map with the forecast date or time highlighted. You can use this timeline to shift the displayed information through time, or animate it using the Play button. The MetEye weather forecast can also be viewed in text mode by selecting Text Views at the top right of the map. In MetEye’s Map View you can search for your location in the text box above the map by town, city, postcode or longitude/latitude and make a selection from the dropdown menu. Choosing a location from this list drops a marker on the map, zooms in and displays the weather forecast. You can move around the map using the zoom buttons or click-and-drag. You can also click any point on the map to display the forecast weather popup box for that location. The MetEye mapping tool is not only great for a quick overview of the weather, but if you delve deeper you’ll find highly detailed forecast information out to seven days for wherever you are in Australia. This information is only limited by how you use it! For more information and to find the forecast for your location, visit MetEye here: www.bom.gov.au/australia/meteye.